Popular conspiracy theories propose that members of UK government murdered Diana, Princess of Wales; climate change is a hoax orchestrated by the world’s scientists to secure research funding and pharmaceutical companies and governments cover up evidence of harmful side effects of vaccines for financial gain. Conspiracy theories like these accompany almost every significant social and political event and can typically be defined as attempts to explain the ultimate causes of events as the secret actions of malevolent powerful groups, who cover up information to suit their own interests. Fake news, which involves the publication of fictitious information on social media, appear to be a fertile ground for conspiracy theories to flourish. Indeed, millions of people subscribe to conspiracy theories. Conspiracy theories are, therefore not reserved for only people who are paranoid, but rather, they are a normal everyday process that we are all susceptible to. With the popularity of social media, conspiracy theories are at our fingertips more than ever before. Reposted from Staffordshire University’s Election Experts. This entry was posted in Social psychology, What's the harm. Bookmark the permalink. 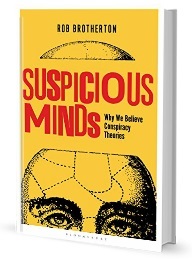 As a fellow psychologist and someone who subscribes to (some) conspiracy theories, I’d like to hear why you think it’s valid to dismiss all conspiracies out of hand by grouping them together as a phenomenon that requires some sort of explanation? I ask this because, for example, the idea that intelligence agencies could listen in on conversations through phones, TVs and other devices used to be derided as a conspiracy theory that only tinfoil-hat-wearing morons would believe, until documents leaked through WikiLeaks showed that the intelligence agencies were doing exactly that. Surely if we view ourselves as scientists on a mission to find truth, we cannot start from the position that every conspiracy theory is definitely false? As a very active user in social-media I run into conspiracists in various large groups on a regular basis. Interestingly I run into them most often in an Atheist group. I have noticed a couple of things. Many at some point believed in God but for one reason or another turned away from that belief system and then it seems inserted conspiracy. There does appear to be significant similarities between beliefs. Both believe in an unprovable entity that has power over them. Both blame issues in there life on the actions of the ‘entity’. I am curious if you have done any research in this correlation.